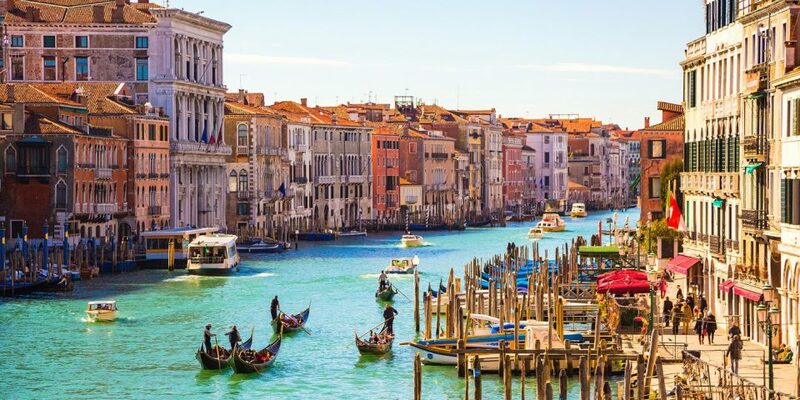 Our itinerary begins with two nights in incomparable Venice, the world’s most famous lagoon. We’ll explore the islands of Burano and Torcello and cruise down the Grand Canal. A charming 17th century Venetian noble palace in Follina is our base for exploring the Prosecco wine region. We’ll discover the village charm of hilltop Asolo and Antonio Canova’s sculptures at Possagno. 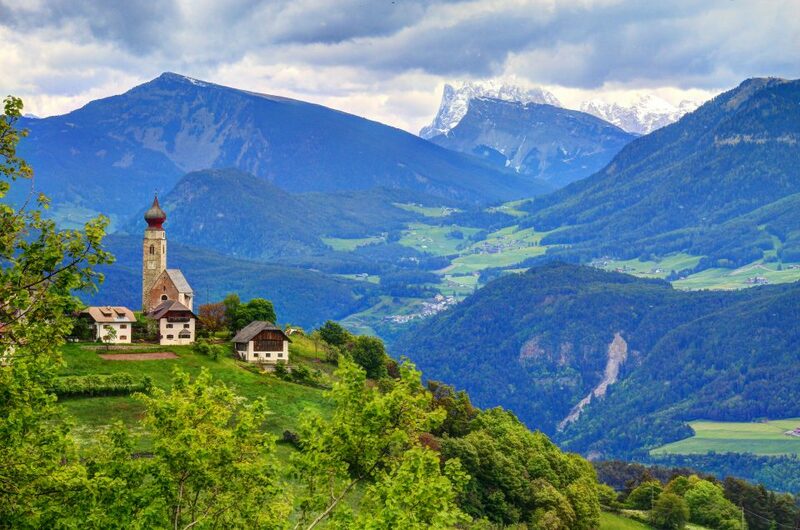 A drive north through the Dolomite mountains will take us to wonderful Bolzano and Austrian Italy. Following a train ride and a morning’s walk on the Renon Plateau we’ll visit Otzi, the 5,000-year-old Iceman. The lovely town of Riva lies at the top of Lake Garda. We’ll board a ferry here for Malcesine and then drive south to romantic Verona with its first century Roman Arena. Finally, the villas of architect Andrea Palladio and his incredible Teatro Olimpico at Vicenza will top off our 12 days. All this and more you will discover in the northeast Italian regions of Veneto and Alto Adige! The history of Venice began in the 5th century when hordes of murderous Goths and Huns swept down the Italian peninsula, laying to ruins 1200 years of Roman civilization. With little possibility of escape frightened inhabitants along the northern coastline of the Adriatic Sea fled to islands in the lagoon where barbarians, ignorant of seafaring, could not follow. Over the following centuries, as more and more refugees arrived, millions of posts were sunk into the shallow lagoon and used to support an artificial surface that would connect most of the 117 small islands. While the rest of Italy receded into the Dark Ages Venice grew into a powerful and prosperous seafaring republic. Enduring one thousand years the republic at times teetered but did not fall until the arrival in 1797 of the forces of Napoleon, who personally never saw the place. Afternoon arrivals to the luxury Hotel Bauer Palazzo (two nights) a short walk from Saint Mark’s Square. Your tour manager will be expecting you for a late afternoon welcome meeting and aperitifs at the rooftop hotel bar Settimo Cielo followed by an included dinner. Today begins with a local guide tour of St. Mark’s Square that includes the Doge’s Palace and the Basilica, the power and soul of the 1000 year maritime republic. And after time on your own to get lost in the maze of Venetian alleys we’ll board our private boat for an exploration of the Venetian Lagoon. Our first stop is Torcello – in ancient times a summer retreat for the Roman nobility; during the 5th and 6th centuries one of the first refuges from the barbarian invasions; and in medieval times a productive and powerful center of commerce. 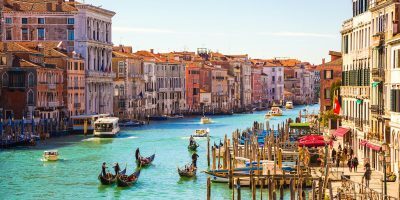 What remains today is a quiet fisherman’s port, archeological remains, a 7th century cathedral and a fabulous restaurant where we’ll experience a delightful array of Venetian specialties accompanied by Bellini and Prosecco. 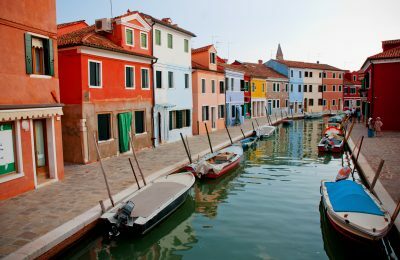 A short distance away we’ll visit the island of beautiful Burano, known for its colorful homes and the production of handmade merletti (lace). Cruising through the Grand Canal with tales of historical palaces and ancient intrigues will conclude our first full day on tour. Padova, an ancient Roman town, has a long and rich history. It is home to one of Europe’s oldest universities (1221), counting among its illustrious alumni Petrarch, Dante and Galileo, and was the setting for Shakespeare’s The Taming of the Shrew. This morning we’ll have a guided city walking tour highlighted by a visit to the Scrovegni Chapel with the extraordinary early 14th century frescoes of Giotto. Follina is a charming village, well known for its position along the Strada del Prosecco and for its beautiful 12th century abbey. The lodging for our three nights’ stay is the Hotel Villa Abbazia, a 17th century complex containing sixteen rooms. Prosecco is a “ready to drink” sparkling wine made from the glera grape, fermented in autoclave (tanks) rather than bottles. 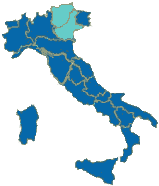 The Prosecco DOCG (superior) region lies in between Conegliano and Valdobbiadene. Our day begins in Follina with a visit to the Abbey of Santa Maria followed by a tour of a local winery where we’ll taste their Brut, Extra Dry and Dry versions of Prosecco. 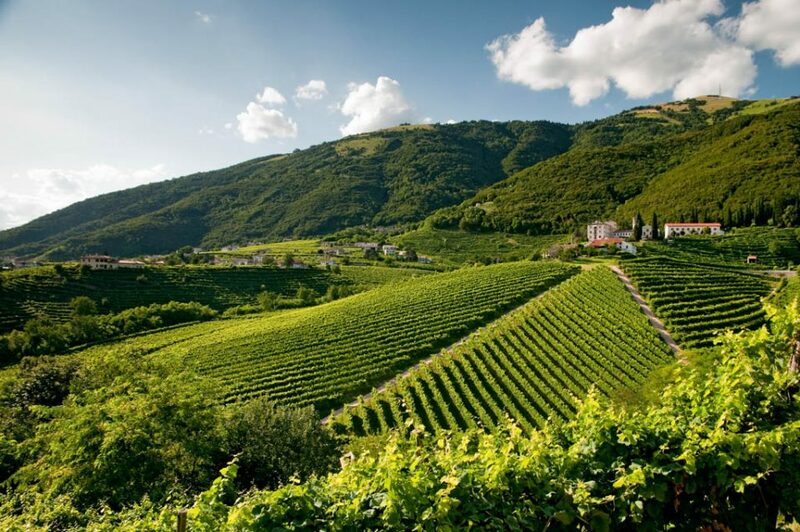 After a light lunch we’ll take a scenic drive through lush, vineyard covered hills to reach Conegliano where our guide will lead us on an exploration of the town. On our return to the hotel we’ll visit another winery in the Conegliano hills. 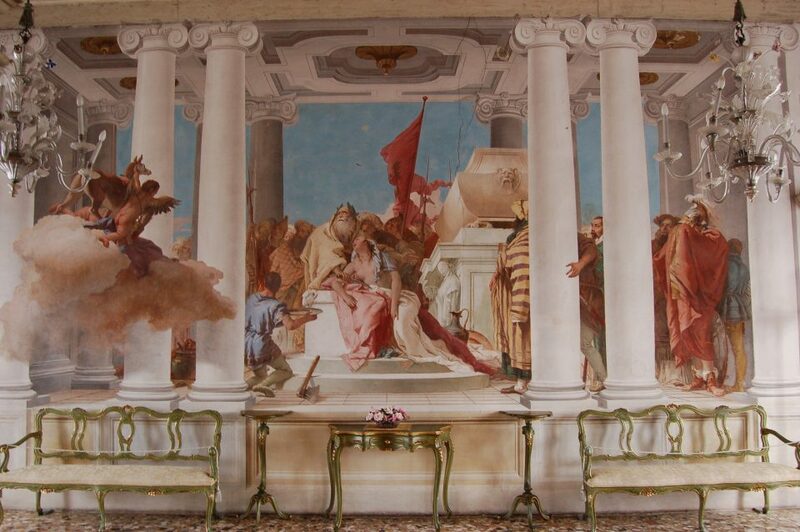 Guided visit to Villa Barbaro di Maser, a medieval palazzo transformed into a country villa designed by Palladio, decorated with a cycle of frescoes, the master-work of Paolo Veronese. Asolo, a small hill town that has been home to artists and poets over the centuries, is an enchanting place where, according to some, time slows and the inhabitants live in a perpetual state of spring fever. The truth of this you will attest to yourself but its beauty and charm are undeniable. 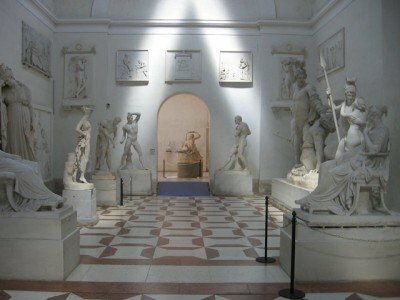 Antonio Canova (1757-1822), one of the most accomplished sculptors of all time, was a native of Possagno, just six miles from Asolo. 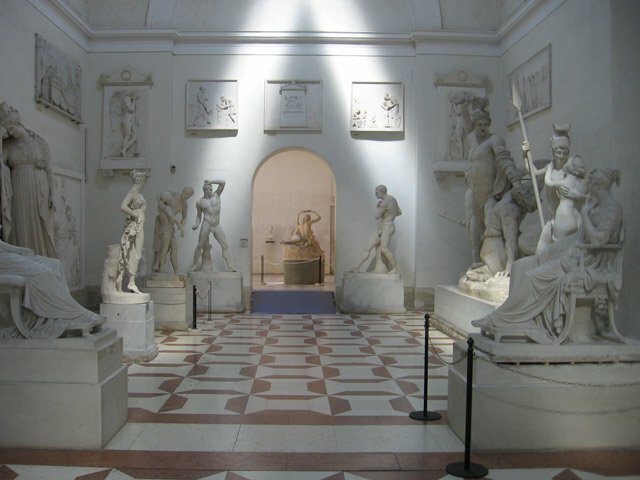 The Canova museum includes his birth home and the gipsoteca, a splendid collection of all of his works in gypsum, the material he used after modeling in clay and prior to sculpting in marble. We’ll also visit his Tempio Canoviano, the neo-classical temple that became his ultimate resting place. This evening we’ll dine at Villa Abbazia’s Michelin starred restaurant. This morning we’ll take the Dolomite panoramic route north into the region of Alto Adige. Italy has no end of beautiful towns and we’re about to discover another. 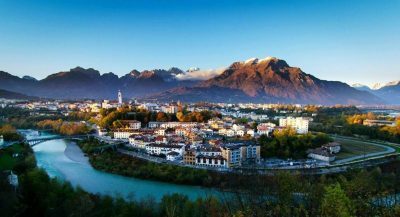 Situated on the Piave River with the Dolomite Mountains as backdrop, Belluno has a lively pedestrian center with Venetian architecture and excellent trattorias. (Try the polenta and montasio cheese filled ravioli with black truffles!). Further on we’ll stop for panoramic views in the mountain hamlet of Moena, 3,900 ft above sea level. The Adige River, the second longest in Italy, has its source in the alpine areas near the borders of Austria and Switzerland, flows south through Verona, then east to the Adriatic sea. 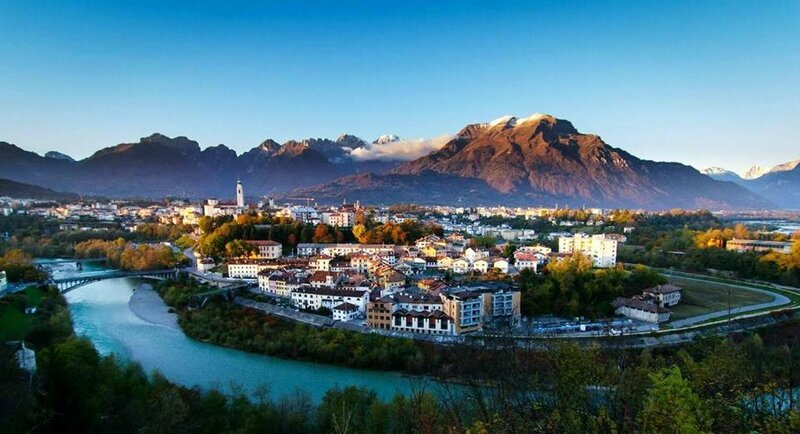 The river gives its name to the Alto-Adige, a bilingual province also known as Südtirol, which up until the end of WWI was part of the Austro-Hungarian Empire. With the majestic Dolomite mountains in the background, its fertile valleys are prolific producers of fruit, wine and cheeses. Bolzano, the provincial capital, will be our host for three nights, staying at the centennial Park Hotel Laurin. This evening at our included dinner we’ll have a taste of Austro/Italian cuisine. 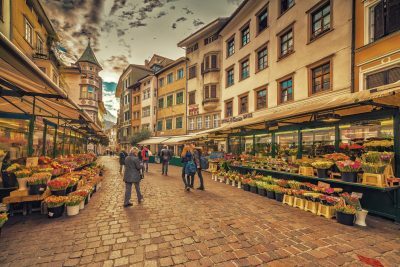 It’s difficult to imagine a more delightful city than Bolzano, with its wonderful architecture, pedestrian lanes, market squares, parks, rivers and flowers. Our day begins with a local guide tour of the town and its unique history as the most important trading center between northern and southern Europe. Afterwards we’ll visit the medieval Castel Roncolo with its excellent cycle of frescoes on the story of Tristan and Isolde. The Renon, the high plateau above Bolzano, is a beautiful area of sunny meadows and farmhouses where 97% of the population is German speaking. To arrive there we’ll ascend 3,000 feet on a 12 minute cable car ride; travel 30 minutes in a 1907 vintage narrow gauge train; and take an easy walk with our local guide to hear stories of the Teutonic Knights and to see the earth pyramids, a rare geological formation; enjoy wonderful views of the Dolomite mountain peaks followed by a stop for lunch and a delicious local treat kaiserschmarren. Afternoon and evening free in Bolzano to enjoy a truly unique experience of Italy. Lake Garda, the largest in Italy, is where we’ll spend our morning. 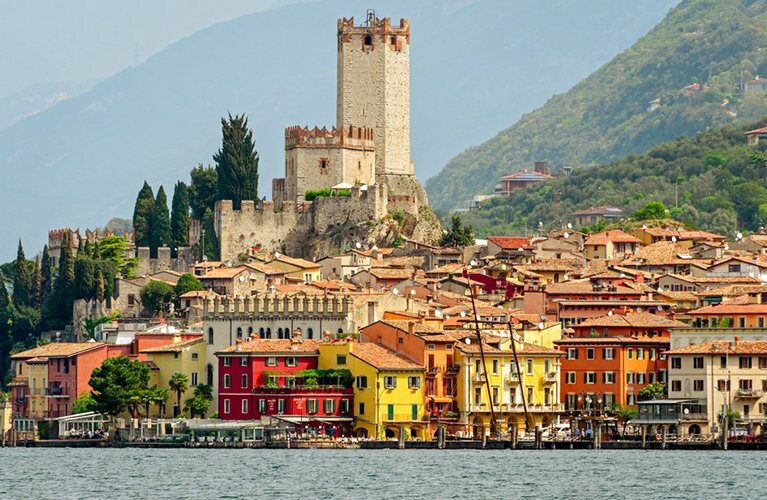 First, we’ll explore the lovely port town of Riva del Garda and have time for a leisurely lunch. Then we’ll board a ferry for a cruise that will take us past the village of Limone, across the lake and east to the village of Malcesine. Verona, one of Italy’s most magnificent and picturesque cities, is situated on the looping Adige River and boasts wide pedestrian lanes and squares, elegant shops and cafés. Roman origins are amply demonstrated by the ancient forum, theater and famous amphitheater – one of the best preserved of antiquity and now hosting a vibrant summer season of opera. Verona’s rich medieval heritage, immortalized by Shakespeare, attracts romantics from all over the world seeking traces of the star-crossed Romeo and Juliet. Our lodging for three nights will be the Hotel Due Torri, a lovely 14th century palazzo in the center of town. Click hotel link for photos and information. Guided orientation walk of the city followed by an evening on your own. From the 15th to the 18th centuries, thousands of luxurious villas and gardens were built as summer homes throughout the Veneto by wealthy Venetians. We’ll begin this morning with a guided tour of Villa Valmarana ai Nani and the sublime frescoes of Giambattista and Giandomenico Tiepolo. For the rest of the day we’ll occupy ourselves with the works of one of the most important architects of this or any era, Andrea Palladio, the master of harmony and proportion. A five minute walk will bring us to the Villa La Rotonda, his best known creation, where we’ll have a private tour of the interior and gardens. 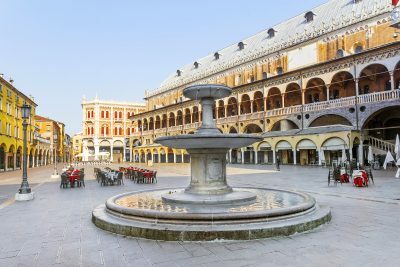 The afternoon will find us in sparkling Vicenza, the city of Palladio, highlighted by the Teatro Olimpico, the oldest working indoor theater in the world (1580) and one of the marvels of the Renaissance. In the 13th century after a period of feuding and vendettas, not unlike that of the fictional Montagues and Capulets, one family rose to power, the della Scala. They greatly expanded the power and territory of Verona, hosted Dante in exile and were patrons of the arts. Towards the end of their reign, as the populace grew tired of their increasing tyranny, Cangrande II (big dog junior) erected an enormous castle with an escape-route bridge across the Adige river. Our morning will commence with a visit to this Scaligero Bridge and Castelvecchio, also home to the Civic Museum. Our guided tour of the historic district including the famous Arena, the ancient Roman amphitheater, will follow. Afterwards we’ll leave you to your own explorations of this most pleasing town. Your included Verona card will provide you entrance to many other interesting sites and museums. Most of the walking on this tour is not difficult. However you will be on your feet several hours each day. The approach to Villa La Rotonda is steep and on uneven surface. Our boat trip through the Venetian Lagoon requires getting into and out of a boat three times. If you have mobility issues this is not your tour. We do not provide refunds for: non-medical personal problems, air carrier delays or cancellations, inability to obtain passports, business problems or emergencies. All ground transportation Days 3 to 11. Transfers on Day 12 to Verona airport or train station. 11 nights’ hotel accommodation with breakfast, 5 dinners and 3 lunches including beverages (wine or beer or soft drinks and water). Admissions to all sites visited as a group, as listed in bold on the tour itinerary. Check-in time at the Hotel Bauer Palazzo is 2pm but you are welcome to arrive earlier leaving your bags at reception. We recommend that you arrive no later than 3:30pm. Your tour manager will be expecting you in the hotel reception area at 6:30pm for a welcome meeting and aperitifs prior to our included dinner. Morning maxi-van taxi transfers will be to Verona airport and train station. Most of the walking on this tour is not difficult. However you will be on your feet several hours each day. The approaches to Villa La Rotonda and Castel Roncolo are steep and on uneven surfaces. Our boat trip through the Venetian Lagoon requires getting into and out of a boat five times. If you have mobility issues this is not your tour. Are located in quiet locations within historic districts. Hotel rooms on this tour may be smaller than what you are used to in your home country and have one queen or king bed or two twin beds, with private bath.